Khawaja Shamsuddin Azeemi is a scholar of international repute in the field of spiritualism. He is the present head (khanwada) of the Azeemia Sufi Order. He was born on 17th October 1927 in Saharunpur, India. His lineage goes back to Hazrat Abu Ayub Ansari, the famous host of Prophet Muhammad (pbuh). Khawaja Shamsuddin Azeemi lived with and served his spiritual master Huzoor Qalandar Baba Auliya (RA) for sixteen years until Huzoor Qalandar Baba Auliya departed from this physical world. During this long companionship Huzoor Qalandar Baba Auliya prepared his able student, both at conscious and subconscious levels, to enable transference of his spiritual knowledge to him. When a student of the founder of a Sufi Order is transferred to that complete mental framework (pattern of thinking) which the founder spiritually inherited from the Holy Prophet Muhammad (pbuh) he is called the Khanwada of that Sufi Order. When Huzoor Qalandar Baba Auliya was about to pass away he blew three times at Khawaja Shamsuddin Azeemi’s head and uttered… “You are to take my place and run my Silsila (Sufi Order) after me…the people who run a mission work obsessively”. 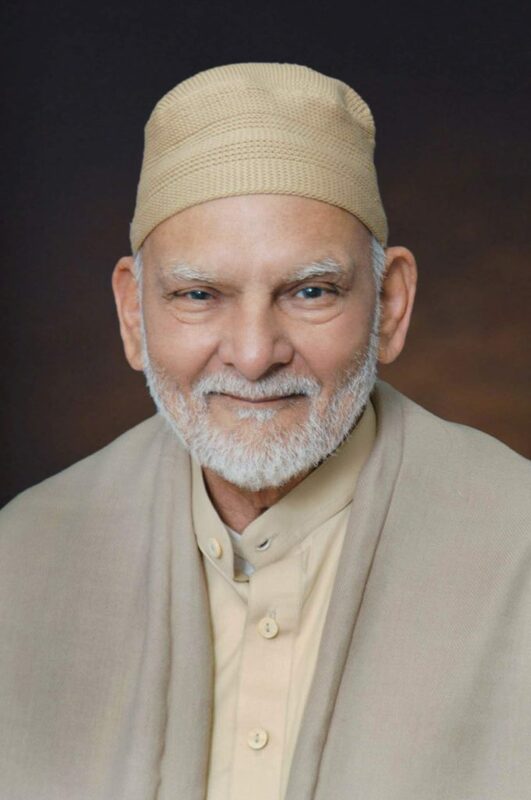 Khawaja Shamsuddin Azeemi acted upon the advice of his spiritual master and worked day and night to promote his mission to all corners of the world. As a result, the Azeemia Sufi Order is now a well-known and respected Sufi Order across the globe. One thing that particularly stands out in Khawaja Shamsuddin Azeemi’s teachings is the way he tries to arouse feelings of love for Allah in people’s hearts. He has unveiled the mysteries surrounding spiritual knowledge and taken it out from an unrealistic and imaginary traditional image and introduced and taught it as a science to the satisfaction of the modern scientific mind. Presently there are more than seventy Muraqba Halls. (Meditation centres) throughout the world working under his patronage to promote and spread spiritual knowledge and to serve humanity by offering solutions to their physical, mental, and social problems. Khawaja Shamsuddin Azeemi is the Chief Editor of the Qalandar Shaoor International digest. He has been writing columns for various newspapers and magazines for the past four decades, which cover a variety of spiritual subjects. He has answered numerous questions on paranormal manifestations and spiritual phenomena to the satisfaction of curious minds. He has authored sixty booklets and twenty-nine books on spiritualism, parapsychology, metaphysics, telepathy, meditation, and colour therapy. Some of these books have been translated into other languages such as English, Sindhi, Arabic, Persian, Thai, and Russian. He has also authored a remarkable book on the life history of the Holy Prophet (pbuh) titled as Mohammad Rasool Allah, The Prophet of God. In the first volume he has portrayed, in a unique way, the Holy Prophet’s struggle and efforts to spread his mission. Volume 2 of the same book presents scientific explanations of the miracles performed by the Holy Prophet (pbuh). In the third volume he has explained the underlying meanings of the events that occurred in the lives of the prophets of God. Light and Colour Therapy is another field which he has introduced in his unique scientific style. This book presents, from theory to practice, a healing method using Light and Colour based on his decades of experience in this field. In order to promote the learning of inner knowledge he has established more than ninety spiritual libraries throughout the world. His books are taught not only in the Qalandar Conscious Academies but also in colleges and universities in Pakistan and abroad. Three of his books have been included in the syllabus of Salford University, Manchester UK. His book Ehsan-o-Tasawaf has been included in the syllabus of M.A. Islamiyat at the Bahauddin Zakariya University, Multan. He has been appointed the Faculty Member and an Associate Professor of Bahauddin Zakariya University, Multan, as a token of acknowledgement of his achievements and contributions. He has been invited to give lectures at several universities and other educational establishments in Pakistan and abroad, which include Glasgow University, Arthur Findley College in London, Karachi University, Faisalabad Agricultural University, Lahore Bar Council, and King Edward Medical College. He was also presented with the shield of Walthamstow Town, London by the Lord Mayor of Walthamstow. Seminars, conferences, lectures, public meetings, and workshops arranged on the subject of Spiritualism and his appearance in many radio and TV programs across the world have played a vital role in introducing this sublime body of knowledge. The Khawaja Shamsuddin Azeemi Society has established a public school in Surjani Town in Pakistan especially for the benefit of children from low earning families. This Society aims to promote the education of modern sciences as well as the Holy Quran and Islam in general, and is planning to establish high standard educational institutes, libraries and research bodies. It also has a separate school, Behr-ul-Noor (The Sea of Light), wholly devoted to Quranic education. A phone service is in operation, both within Pakistan and at some Azeemia centres across the world to present solutions to people’s social, family, and spiritual problems, free of charge. Every month more than eleven thousand letters seeking the guidance of Khawaja Shamsuddin Azeemi are received by Markazi Muraqba Hall and replied to as a free service. In addition to the above, Surjani Welfare Clinic, blood transfusion service, and a free medical complex are also busy providing free health services to the people of Surjani Town in Karachi. Khawaja Shamsuddin Azeemi is a staunch supporter of women’s rights and the removal of gender inequality. In his words, “the same soul is operating in both men and women, and they are therefore both equally capable of progressing in the field of spiritualism”. Khawaja Shamsuddin Azeemi’s mission and his invitation to the whole of mankind is that they should learn the Inner Knowledge and realise their latent potential so that they may get to know the Lord Creator of the universe, and hence enjoy a blissful life both here and in the hereafter.